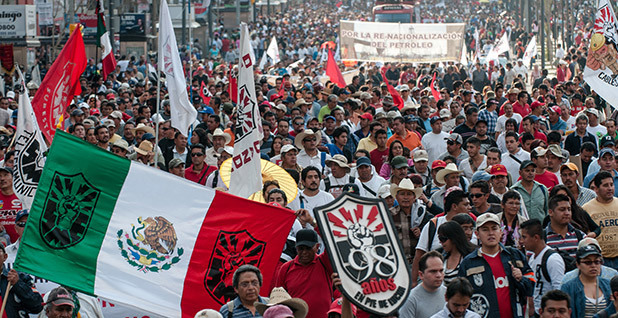 The privatization of Mexico's electricity and oil sectors sparked massive rallies like this one in 2013. 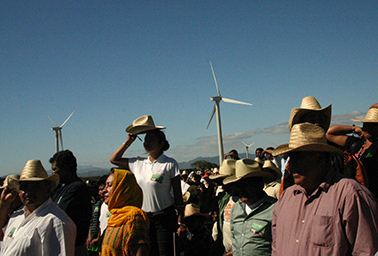 Mexico's foray into the free market could affect its ability to meet its climate targets. Photo courtesy of Flickr. Where some are planning walls, others are planning windows. Or rather, pipelines. Across the dusty 1,954-mile border between Mexico and the United States, international companies are gearing up to spend more than $10 billion on thousands of miles of steel tubes carrying cheap natural gas from Texas to hungry markets on the other side of the Rio Grande. The recent surge in natural gas investment is just one element of the colossal changes underway in Mexico's energy portrait. Fracturing monopolies, surging demand, falling oil prices and ambitious climate change mitigation goals are intersecting in Mexico, creating unprecedented challenges and opportunities for curbing greenhouse gases. The United States' southern neighbor is the world's 10th-largest oil producer, and by 2050 is expected to become the world's fifth-largest economy. Though it contributes less than 2 percent of the planet's carbon emissions, the country made an aggressive climate pledge toward a new global accord: to peak national emissions by 2026 and drive them down 22 percent by 2030. That makes Mexico one of the largest developing countries to issue such a proposal. The world is watching. Emerging economies have often argued that they should be compensated before they take action against climate change. Mitigation opponents in wealthy nations, on the other hand, justify inaction because cutting carbon pollution from developing countries is sine qua non for curbing global warming. Mexico pokes a hole in both arguments. As a large developing resource economy in the Western Hemisphere -- and a major oil producer, as well -- it has embraced unconditional emissions targets. Moreover, Mexico doesn't fit well into any existing power bloc in U.N. climate negotiations. Instead, it borrows elements from all of them, hurdling over the old rich-poor divide. Its role as a bridge builder was highlighted when Mexico hosted U.N. talks in Cancún in 2010 and argued that climate change is a global problem that required everyone, not just wealthy countries, to fix. Two years later, the country approved the first comprehensive climate law in the developing world. Now, in the runup to Paris, where leaders hope to sign a new international agreement in December, Mexico is on the front lines in challenging all nations to step up to take bolder climate action. "Given that Mexico was the key place where this concept was developed and formalized, Mexico wanted to be an important player going into the meetings in Paris," said Carlos Pascual, who served as the U.S. ambassador to Mexico from 2009 until 2011 and later the State Department's special envoy and coordinator for international energy affairs. Will market liberalization help or hurt climate action? The new climate law set targets for curbing greenhouse gas emissions and ramping up clean energy production. 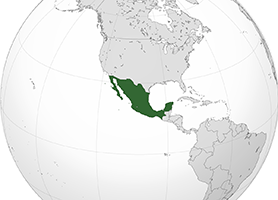 By 2050, Mexico expects to curb greenhouse gas emissions 50 percent relative to 2000 levels. The government has also pledged to generate 35 percent of its electricity from clean sources by 2024 (up from the current 25 percent) and 60 percent by midcentury. Now that Mexico has shown that it is willing, the question is whether it is able. There are many confounding factors, but the largest may be the Mexican energy revolution. For the first time in more than 75 years, the electricity and oil sectors are opening up to private investors, introducing competition to its energy-producing stalwarts, putting billions of dollars of profits and tax revenue into play. "It's rare to have a market that large open itself in this day and age," said Carlos Solé, co-chair of the Latin America practice at Baker Botts LLP, a law firm that represents many energy companies. The state oil monopoly, Pemex, and the state electricity monopoly, CFE, ruled Mexico's energy systems since they were nationalized in 1938. The companies are a point of national pride for Mexicans, and their federal government relies on Pemex for more than a third of its revenue. "People in Mexico grew up with and were taught in school that the nationalization of oil and gas was for the benefit of the Mexican people," said Pascual. "The day that oil and gas was nationalized was a national holiday." The monopolies powered Mexico for decades as the world grew addicted to oil. But blocking outside competition let these energy firms languish and grow complacent. Oil production began declining in 2005, and the recent drops in oil prices have left the Mexican government scrambling to fill a budget shortfall. "Pemex got too big and became inefficient," said Matthew Bey, an energy analyst at Stratfor, a think tank. "Their biggest source of revenue is exporting oil, and a lot of that goes into the United States." But last year, the United States produced more petroleum than any other country, driving down demand for Mexican energy. Meanwhile, electricity prices in Mexico rose, making the country less attractive for international companies wanting to set up factories. "That kind of gave it its drive to bring in foreign investment," Bey said. Pemex and CFE did not respond to requests for comment. In 2012, the government planted the seeds of market liberalization, amending the constitution so that private and foreign investors could buy into Mexico's energy systems and wean the government off oil taxes. The idea was that private companies could more efficiently exploit and market Mexico's fossil fuels, expanding the overall tax revenue pool for the government. However, the idea of selling a public commodity to private interests sparked outrage. During a 2013 debate in the Mexican Congress, Deputy Antonio García Conejo stripped down to his underwear at the lectern, protesting that privatizing energy would rob the nation and that those in favor of the reforms were committing treason. "Pemex is not just an oil company. It's an institution," Bey explained. And Mexico's first foray into the free market didn't go well. In an auction this summer, the government only managed to sell two of 14 offshore drilling plots. Many bidders thought the asking price was too high, the leases too short and the fields weren't that lucrative given the low oil prices in the Americas. This was a rude awakening for the government, showing just how out of touch it was with international energy markets. It also signaled how much Mexico still depends on carbon-spewing resources to power its economy, for export and domestic use. Mexico gets a huge chunk of its energy from burning its own oil, which was the culprit behind its explosive growth in greenhouse gas emissions in the 20th century. Between 1891 and 1982, carbon pollution rose 6.5 percent each year, growing more slowly thereafter. According to the U.S. Energy Information Administration, Mexico gets 53 percent of its energy from petroleum, 36 percent from natural gas, 5 percent from coal and 4 percent from hydroelectric power. The remainder comes from wind, solar and nuclear power. Petroleum, meanwhile, accounts for well over half of the country's fossil fuel emissions, while natural gas accounts for 23.6 percent. The World Bank reports that Mexico's per capita emissions are 3.9 metric tons of carbon dioxide, just a hair below the global average of 4 metric tons. In 2011, Mexico produced 466 megatons of greenhouse gases, up 4.7 percent from the previous year. As such, fossil fuel dependence is a potent threat to Mexico's climate ambitions but remains a pillar for Mexico's economy, which is still struggling to elevate the impoverished. Mexican President Enrique Peña Nieto campaigned on a promise of lifting 15 million people out of poverty, but the poverty rate grew to 46.2 percent between 2012 and 2014 for Mexico's 122 million citizens. 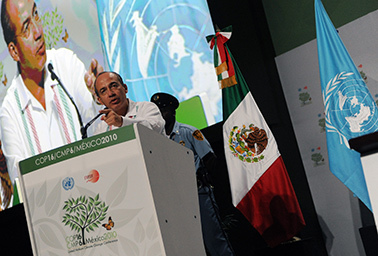 Former Mexican President Felipe Calderon at U.N. climate talks in Cancun in 2010. Photo courtesy of the International Institute for Sustainable Development. For some officials, keeping energy prices down and employment up is a higher priority than averting rising sea levels and more intense droughts. That means pipelines may be lifelines when it comes to meeting Mexico's climate goals. Mexico is lining up to take advantage of the shale boom in the United States, having announced 1,000 miles of new pipelines -- including a 500-mile underwater gas pipeline from Texas -- in a country with only 9,000 miles deployed so far. Though Mexico does produce some natural gas, demand far outpaces supply. The shortfall may grow critical as electricity producers close down old oil and coal plants in favor of cleaner natural gas. The U.S. Department of Energy reported that U.S. gas exports to Mexico totaled 70.9 billion cubic feet in April, a 25 percent increase from the prior year. By 2020, monthly exports are on track to double. In 2014, Mexico levied a tax of $3.50 per ton of carbon dioxide equivalent, carving out a special exclusion for natural gas. Insofar as it replaces carbon-intensive coal and oil power, natural gas is a huge gain in cutting the country's carbon footprint, all while creating new jobs and bringing power to isolated parts of the country. The market liberalization means that Mexican power producers could more easily buy cleaner, cheaper natural gas from abroad instead of burning domestic oil. But that oil may simply go abroad, and low fuel prices may undercut the case for zero-carbon renewables. Nonetheless, renewable energy is also blooming under the energy reforms, and international developers are champing at the bit to get a share of the market. Mexico is a vast country with scattered load centers, and renewable energy could help deliver power to far-flung regions from Baja to Yucatán. In some regions, solar panels and wind turbines are already competitive with fossil fuels without subsidies. The energy reforms also created financial instruments to fund renewable projects and allowed private projects to inject electrons onto the national grid. "You put all these things together, that makes a good environment for us to invest," said Michael Harrington, director of Actis, a private equity fund that invests in emerging markets. "Mexico is by far the one country where I have my team working the hardest." Renewable energy also offers Mexico an opportunity to regain lost ground in manufacturing. This summer, SunEdison Inc. announced that its photovoltaic factory in Juárez reached its peak production capacity of 1.3 million solar panels per year, making it the largest solar manufacturing facility in Latin America. These factors add up to strong momentum for deploying clean energy and cutting greenhouse gas emissions in Mexico. "It's happening more or less on the time scale [the government] said, which is a lot faster than the private sector expected," Harrington said. However, energy transmission is still going to be a challenge across wide swaths of the country, and the inefficiencies and corruption that plague emerging economies still lurk throughout the country. Across the border in the United States, with the 2016 presidential campaign underway, Mexico occasionally enters the discussion, but rarely in the context of energy and climate collaboration. "The focus on border issues related to immigration has eclipsed a broader view of economic interests and a mutual energy and environmental interest," said California Sen. Bill Monning (D), who joined a delegation to Mexico in August. "While our targets and objectives are not identical, they lend themselves to sharing academic research, technology exchange and business investment information." Wind and solar power currently make up less than 2 percent of Mexico's energy mix. Exactly how Mexico plans to boost its renewable energy generation remains unclear despite ambitious plans to peak greenhouse gas emissions. Photo by Mark Stevenson, courtesy of AP Images. With so many tools at its disposal, many think that Mexico can meet its environmental and economic obligations. "I'm very optimistic," said Rogelio López Velarde, a partner at the López Velarde, Heftye and Soria SC consulting firm, who likened the energy reforms to the Glasnost and Perestroika policies during the twilight of the Soviet Union. The Mexican public also seems on board with the transition to private markets and cleaner energy now. "Actually, people are very happy with the energy reform," he said. "Threats of unrest didn't materialize." Still, a major resource economy like Mexico is beholden to the whims of international market forces, which have drastically shifted before and could do it again, throwing a wrench into all of these reforms. And the freer market means that fossil fuel consumption could resurge if prices drop again. The country is now preparing another round of auctions for oil, and observers are keen to see whether the government has learned from its past experience. The auctions may be a microcosm of Mexico's approach to energy and climate as adapts and copes with a free market. "A lot of the private sector is taking a wait-and-see approach," said Pablo Zárate, a senior consultant at FTI Consulting in Mexico City. "They want to see how the wholesale market will pan out." Mexico's success will likely depend on how it holds itself accountable in curbing emissions and growing its clean energy sector. "Right now, you have the 2018 and the 2025 goals, but you don't know what the goals for each year are," Zárate said. "The details and specifics of how this market will work are not there yet."